All riders, please wait for the site to be set up so that your donations will contribute to your own website; TO COME SOON! Once again, this year we will stick to the proposition of bringing joy, if just for a moment, to those who have contracted this horrible disease. 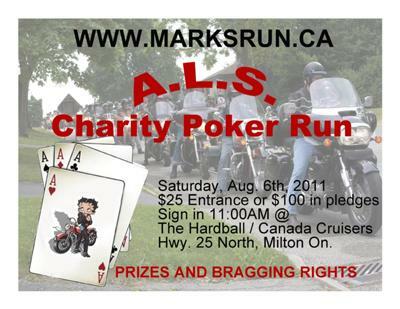 This year we will be having a poker run through one of the most beautiful areas in Southern Ontario. We will start at Canada Cruisers Canada Cruisers and The Hardball HardBallCafe in Milton, Ontario. 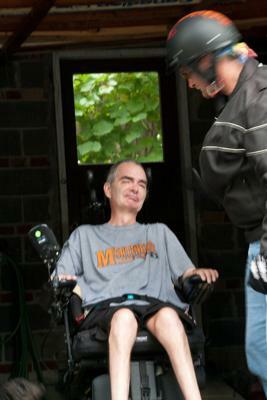 We will set up 5 destinations (to be kept secret till the run starts) where we will have victims of ALS and their families handing out the playing cards. The play area will be between Toronto, Orangeville, Kitchener, Cambridge and Burlington. This is a beautiful area where the Niagara escarpment runs right through which should make for some very enjoyable riding. Obviously the player that returns with the best hand wins and we are planning on having some great prizes. Following the poker run, we will be having many activities including a charity silent auction as well; we will once again be putting on a BBQ. The Hardball will be open for those of you who will chose to hang around for the remainder of the evening. As the ride develops we will be keeping you all informed via our website. As always, Thank You so much to all the bikers who have made this ride a reality!